JSAI (The Japanese Society for Arti?cial Intelligence) is a premier academic society that focuses on arti?cial intelligence in Japan and was established in 1986.JSAIpublishesjournalsoftheJSAIandbimonthlytransactions,andhosts 19 special interest groups. The JSAI annual conference attracts several hundred attendees each year. JSAI-isAI (JSAI International Symposia on Arti?cial Intelligence) 2009 was the First International Symposium, which hosted three co-located international workshops and one satellite workshop that had been selected by the JSAI-isAI 2009OrganizingCommittee.Thisisinsuccessiontotheinternationalworkshops co-located with the JSAI annual conferences since 2001. JSAI-isAI 2009 was successfully held during November 19-20 in Tokyo, Japan; 158 people from 16 countries participated in JSAI-isAI 2009. 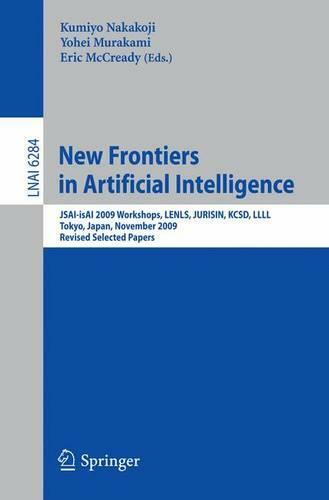 Thisvolumeof"NewFrontiersinArti?cialIntelligence:JSAI-isAI2009Wo- shops" is the proceedings of JSAI-isAI 2009. The organizers of the four wo- shops, LENLS, JURISIN, KCSD, and LLLL, hosted by JSAI-isAI 2009,selected 24 papers out of 61 presentations. This has resulted in the excellent selection of papersthat arerepresentativeof someof the topics of AI researchboth in Japan and in other parts of the world.